How to Remove Virus from Android Smartphone? Clean Android Device and remove Virus, Adware, Malicious Apps and Malware with this complete guide and protect the phone cyber attack. Android is the most popular mobile operating system, thanks to its open source nature and millions of downloadable Apps across Play Store and other Resources. Presently there are more than 2 Billion monthly active Android users across the globe which makes around 90% of the smartphone industry. Also, according to the report, 95 % of every new smartphone runs on Android. Given such a large majority of the user base and also its open source policy. Android is very much prone to be attacked by virus and other malware. According to a report by an independent security firm by Mike Rogan, about 98% software malware is shared by Android OS. This shows how vulnerable Android smartphones are to be infected by the virus. Google regularly releases security patches in software updates to protect Android from any such threat. Many times we download or share the apps from non-reliable sources in a quest of getting a paid version of the app for free or to download a particular app which is not available in Play Store. The apps which are not downloaded from reliable sources like Google Play Store or Amazon Store could be potentially harmful and malicious for your phone and also to you as a user by harassing the privacy. Android Virus includes Spyware, Adware, Malware, Trojans, Vulnerable scripts etc. Today we will learn about their entry, symptoms they cause and removal of virus from the device. How Virus Enter on Your Android Device? The best way to remove the virus from an infected Android mobile is to find the course of its entry into the phone. Once we find it we can eject the virus from the device. There are various paths which attackers use to inject the virus into the device and manipulate the system files to collect your precious data. Downloading Apps from 3rd party Unknown Sources. Downloading files from Deceptive or Harmful Site. Many Apps in Play Store also have the Dormant viruses to be activated later. Many of the 3rd party Ad Networks also inject Adware virus. Pop-ups and Redirects are also one form of necessary Malware. Cracking or hacking Apps which ask for unnecessary and access permissions can potentially inject malware and are very much harmful. There is a myth that Apple iOS is safe because of complete blockage of 3rd party applications. But the fact is there is no smartphone OS which could be protected from vulnerability. Of course the Apple devices are more secure than Android in comparison but still, you cannot completely safeguard a device from the harmful virus. Following are the general effects which a smartphone experience when infected by the virus. #1. Heavy Data usage: The first sign that your phone has a virus is the rapid depletion of the internet data. The virus generally tries to run in the background to send unanimous send to the attacker resulting in the consumption of your internet data plan. #2. Crashing apps: Do apps crash more often then they used to be earlier? Most viruses tamper with your regular operations, it’s common for the apps to force close without any warning. #3. Battery drain: This is one of the most common symptoms which can be affirmed for the virus attack. Malware and Spyware use lot of battery to work thus resulting in quick exhaustion of device power. #4. Pop-ups: Many websites and Apps have pop-up ads which as the name indicates, Ads pop- up when you are using the App or website. If you are gettings too many pop-ups especially suspicious ones, you may be infected by the virus. If not your interest based Ads then don’t click on any of the links. The links may redirect you some third party sites which resemble the original one and deceive you for your Personal info or account credentials. #5. Unexplained charges: Mysterious unwanted billing will hit you the most where it hurts — your bank account. If your device is infected with virus then you may incur unwanted Billings at unusual rates particularly in SMS. The device infected with malware may send SMS and activate packs without your consent. #6. Unwanted apps: Trojans are the bunch of viruses which look like the legitimate app and are designed to look like real apps thus they succeed in deceiving the user. #7. A sudden appearance of unfamiliar apps: Malware can make their way into your phone with apps that you download. They piggyback other Apps without your conscious knowledge. #8. Overheating of the Phone: It is an alarming symptom indicating that your phone posses some malware which is interfering with the apps and causing temperature rise. In most cases, the virus is injected into the device from apps downloaded from unknown sources or in some cases from Play Store. So, it is better to check for such vulnerable apps with Trojan virus. To Remove the Harmful Apps we can try a boot in safe mode. In safe mode, only default apps which were present at the time of unboxing are present and downloaded apps are not available. In safe mode check for device functioning, if the device is working normally then any 3rd party downloaded app is causing the issue. Just reboot the device to come back to normal mode and uninstall any or all the suspicious 3rd party apps and check for normal working. The device will get rid of any sort of virus or malware. Knowingly or unknowingly you may have granted any dangerous app Device administration access. The app may now interfere with the normal working of the device. Also, the app doesn’t get uninstalled until you revoke its administrative access. Step 1. Go to ‘Settings’ of your Android. Step 2. Here look for the option named ‘Security’. Step 4. If you find any malicious apps having access then Deactivate it. Step 5. Now uninstall the dangerous App. Once the administrator access is revoked you can uninstall the harmful app and eject the virus from your device. Just reboot your phone after you have uninstalled the Apps. Due to Android’s open source policy, it is easy for manipulators to infect any Android device. There are plenty of Antivirus apps available on Google Play Store. No antivirus app can provide 100% protection but they are powerful enough to eliminate all major threat and virus from the smartphone. Have a complete scan of the Virus and delete all the related files and folders if detected any. These apps could be helpful to remove any major or minor Adware & Malware from the files. Anti-Virus Apps also provide web protection, real-time app protection and app lock features. Almost all antivirus apps perform the same function so here are a couple of recommendations based on our experiences. You can even try Trojan & Malware detectors for more deep scanning. Build up of useless, obsolete and junk files can cause the phone to slow down at large. Using an App with an ability to clean junk and cache can help clear up some space and also help the device to run more efficiently. Many apps require storage space for there working, junk build up can make a good environment for virus injection. Thus cleaning the older files can help the device work at normal and fix any issues if generated. Google on regular intervals release the updates over OTA with security data to protect the Android. It is always beneficial to update the device software to protect your phone from malicious virus and kill any if already present. You should remove apps which consumes more power making the phone heated. In heated condition, the phone doesn’t work in the way it should due to processing limitations. Therefore it is recommended to uninstall the battery draining Apps. Keeping the battery within the permissible limits will assist the apps to function in the normal fashion. 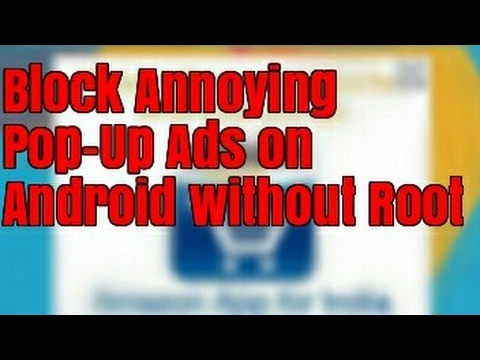 You can stop unwanted and irritating Pop-Up ads with Ad blockers and other techniques. Below is the video tutorial which teaches how you can stop Pp-Up Ads. You can protect your Android device with the help of various Anti-Virus Apps and Ad-Blocking methods and stay safe. If none of the above method works then you have to resort to the final option that is to reset the device. You will lose all your data in the process, so be sure to take the back-up before going ahead. Only backup the media – photos, videos, and music. Resetting will clean all the data along with any virus or malware. I recommend you to reset the device from recovery mode rather than from device settings. To find how you can do that just Google search for your device. But in general, the process includes pressing Power+Volume Down key simultaneously after turning off the device. How to Keep your Phone Safe from Virus? Avoid downloading Apps from Untrusted Sources. If installing Apps from unknown sources then make sure to install the App with “Verify & Install” Option. Do not install hack or crack apps. Read the App Permissions and uninstall the Apps which ask for unnecessary access. Do not use the Apps with accessibility permissions. Keep your storage space free up to 500MB and also keep RAM free. Use Anti-Virus App to scan the phone on weekly basis. Also, keep the virus definition up-to-date. Avoid using apps with drain your battery resulting in heating of the phone. Scan media file in real-time to check for any spyware or malware. Note & Conclusion: With the methods above you can safeguard your mobile from all sorts of Android virus and malware. Regular clean-up of the Android will protect your data and privacy from all sorts of rouge and global malware. I hope the post was helpful. Do comment below for any suggestions or Query. Have a nice day. Cheers! If you've any thoughts on How to Remove Android Virus?, then feel free to drop in below comment box. Please send a virus cleaner to fix the software damages in my phone.. I Rebooted my redmi note 3 but after reboot my phone doesn’t power on Please tell me what to do..